We’ve discussed the topmast before, but it is time for an update. 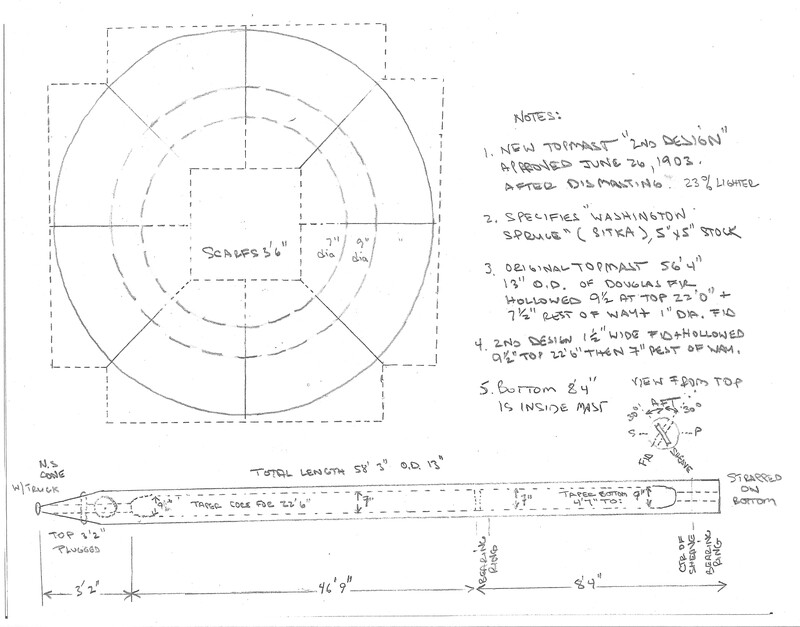 You’ll notice on the topmast sketch ( photo 1) that this spar is not the usual barrel stave lay up. That may be because it is a constant 13″ o.d. its full length. We decided to follow Capt. Nat’s drawing as best we could to gain insights into his methodology. It turns out that it really is an easier approach than the barrel stave approach! 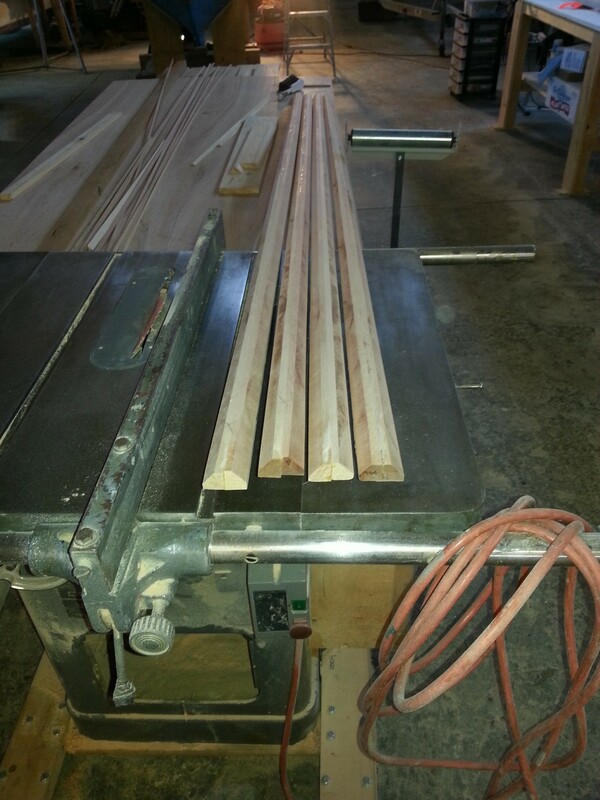 We also found that working in sitka rather than Douglas fir is easier but the saw dust is much worse. The topmast is hollowed out to a diameter of 9″ at the ends and 7″ in the middle; again Capt. Nat was taking out all weight he could while maintaining required strength. The Topmast was a telescoping topmast fitting within the fabricated steel mast, and as you see there is a heel rope sheave at the bottom of the topmast. One end of the wire heel mast rope was fastened inside at the top of the mast, then lead down through the heel rope sheave and up to another sheave mounted at the top of the mast. The wire was then lead down to deck level for hoisting and lowering the mast. The above referenced fid kept the topmast in its erected position. There were slots in the mast and topmast and a shelf inside the mast on which the fid rested. 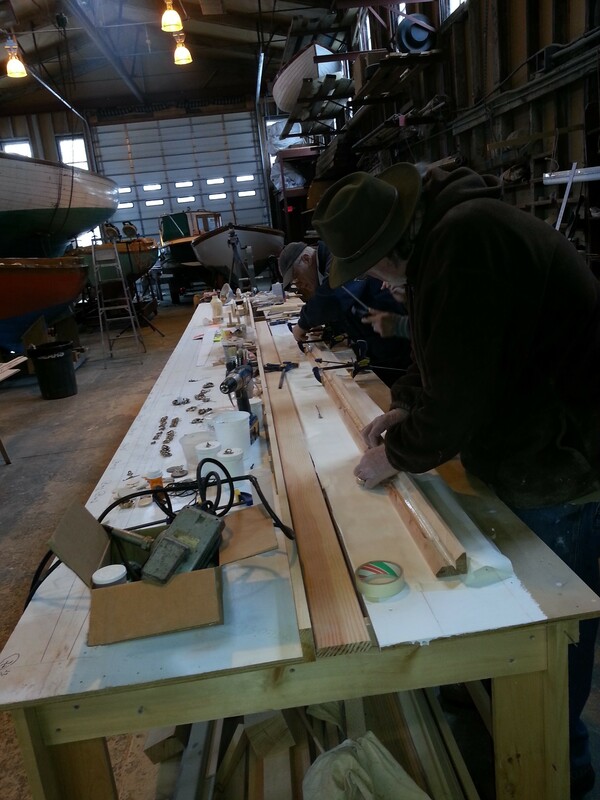 Photo (2) shows us first planing edges of our block of sitka flat, then ripping our eight scale 5″ x 5″ planks which were then glued into pairs for each side. 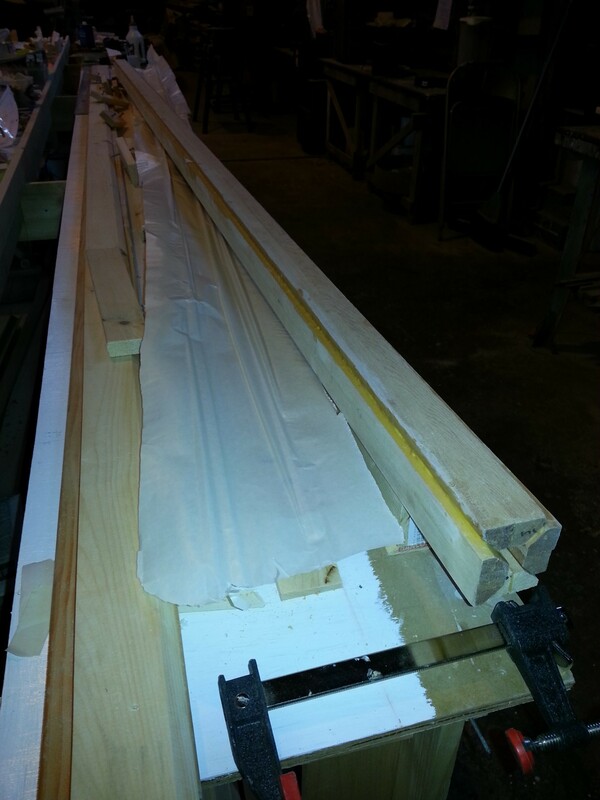 We then routed out quarter round scale 7″ diameter hollow with taper to 9″ hollow at each end for each side. 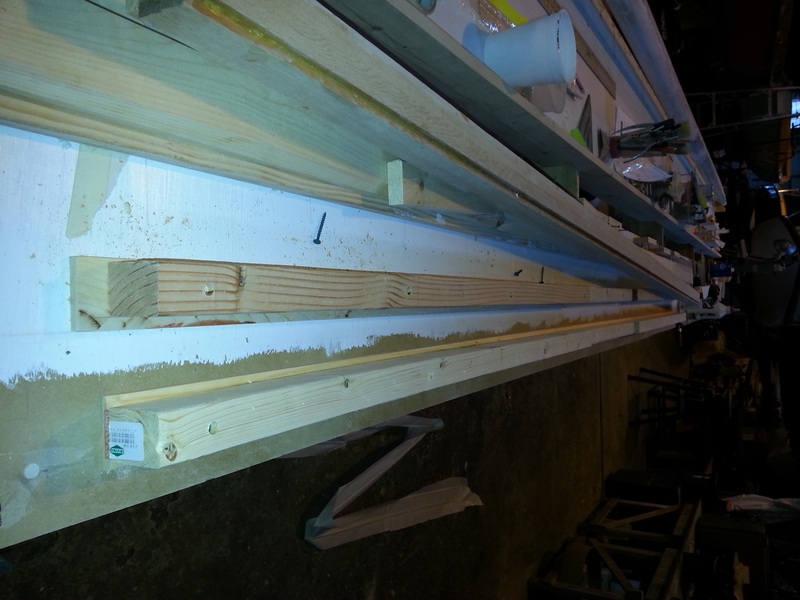 We used a ramp in the middle to raise the router from 9″ depth to 7″ depth. Afterward, each side was mitered with 45 degree edges (4, 5). 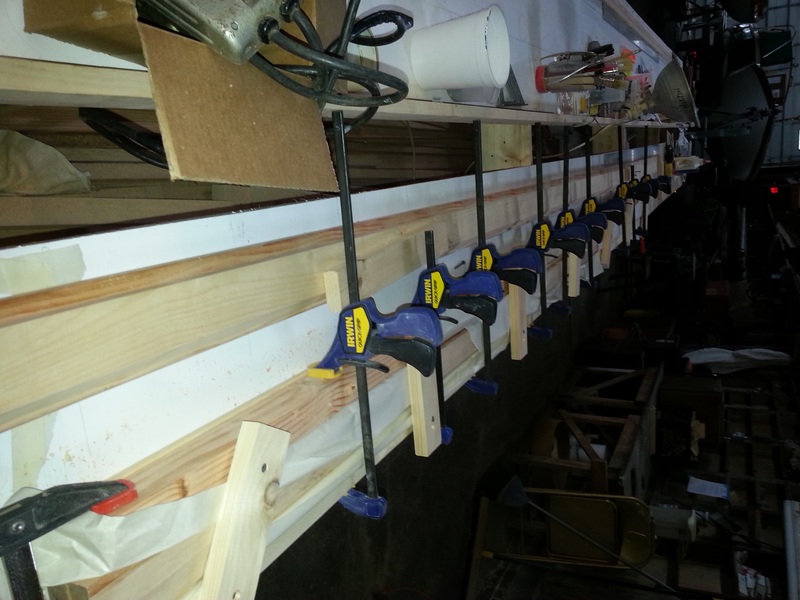 We first attempted a simple glue-up jig approach but found it unwieldy, so we quickly wiped off the glue and with all-hands on deck, including Kyle who we borrowed from the mentoring program, built our second jig and glued the four sides together. This second jig had ledges that conformed the the shape of the sides as shown in the sketch (photo 1) while keeping required pressure on the sides and then the top when finally closed up. As you can see in photo it was a mad dash to recover from the first attempt and to get all four sides glued at once! 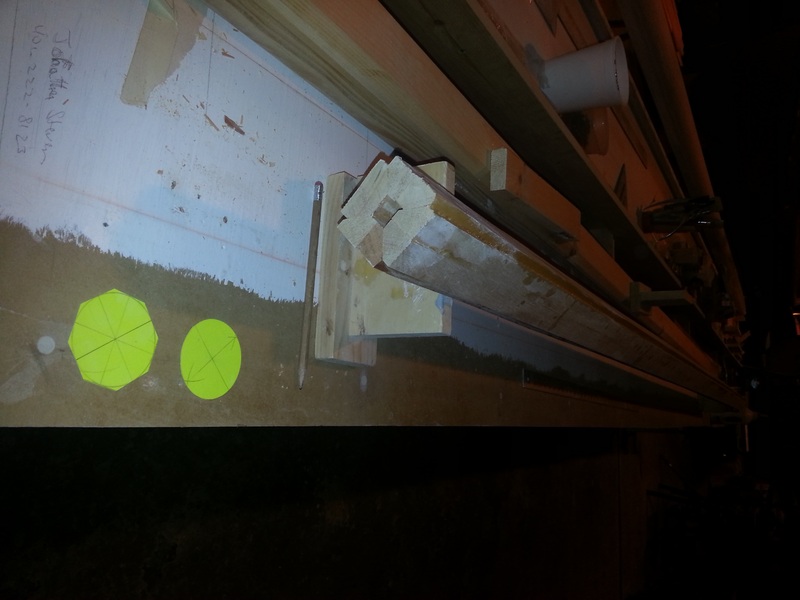 Photos show the topmast sides curing in the jig and then after being removed. Drawings show us planing off the excess on each side to get our square shape. Note the templates in the foreground which we used to get the octagonal outline at each end and along the sides, and the round template for final shape. 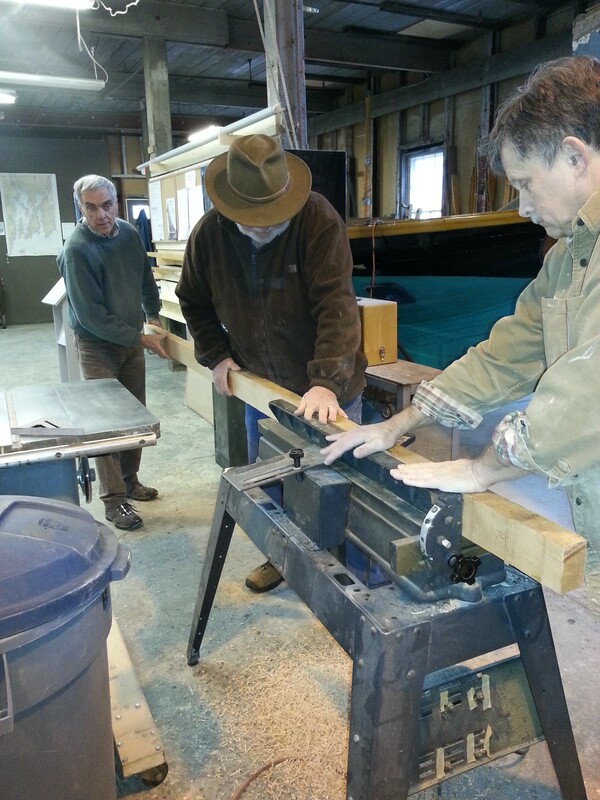 The next pictures show us planing our topmast into octagonal shape. Each set of edges we take off gets us closer to roundness. 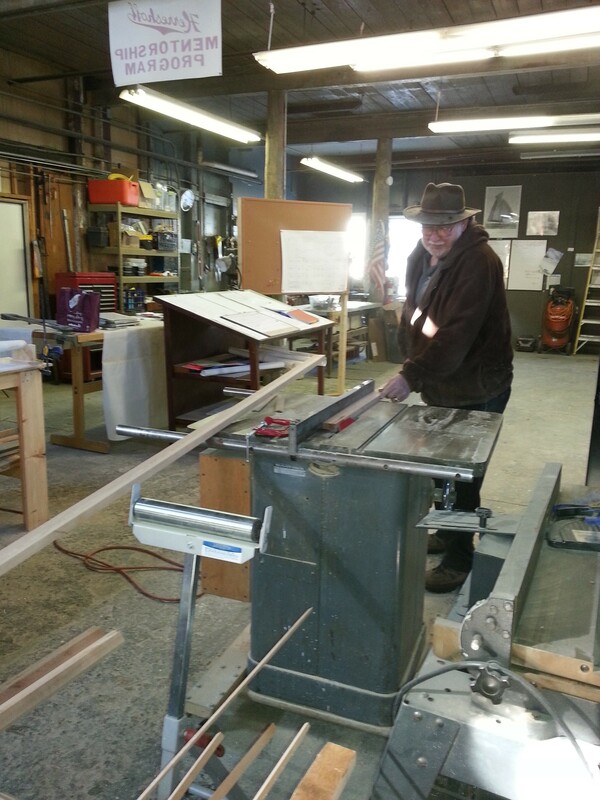 Finally we were ready to use our long board to sand the topmast round. Still to go are steps final sanding, shellacking and varnishing of the barrel, shaping the cone at the top and adding the truck, sheaves and fid slot, but I’ll save these for a later post. 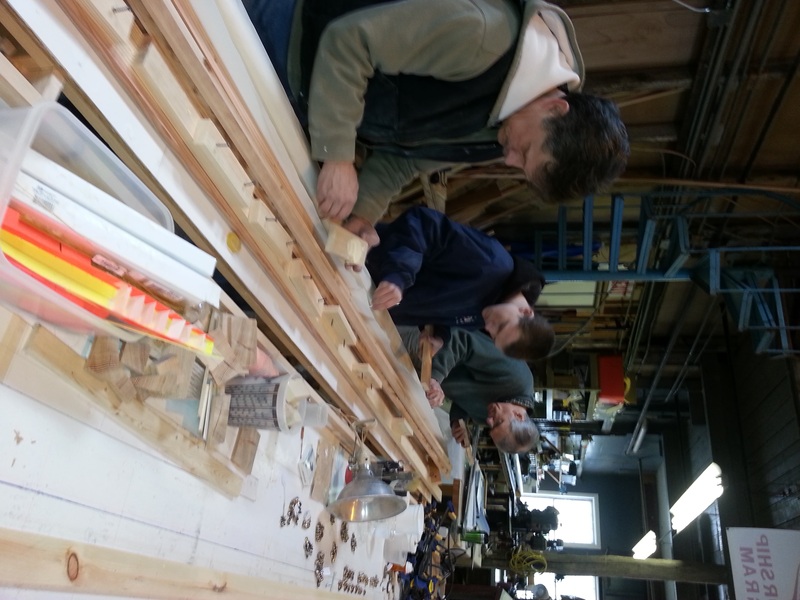 This entry was posted in Builder's Notes & Pictures on April 1, 2013 by Herreshoff Marine Museum/America's Cup Hall of Fame. I am sorry not to have responded earlier. I find I am technologically challenged with the new generation way of communicating! 1. 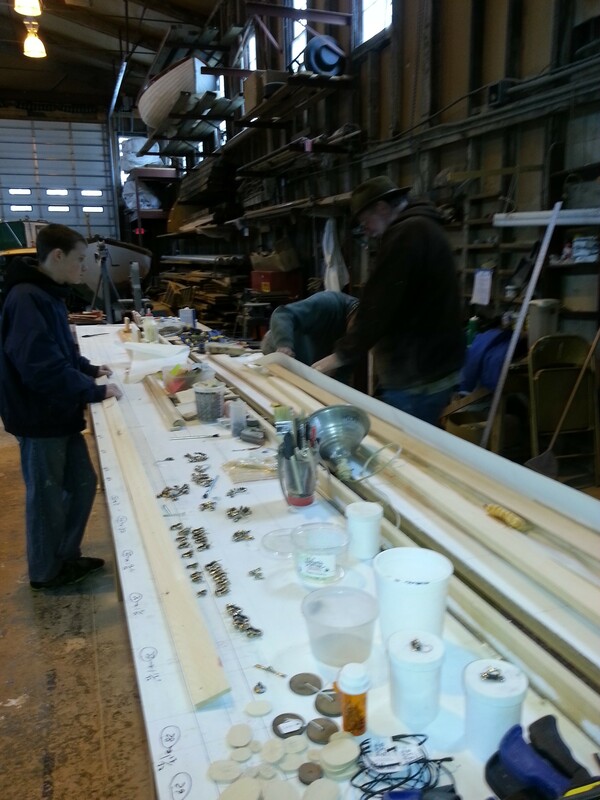 We discuss building our 4′ long real-size spars including the topmast in our postings fall of 2013 so you can see them being built there. 2. The topsail club, yard and topmast are being included in a 4 foot by 8 foot sized diorama. The base of the diorama will show the steel margin plate and aluminum decking and of course the cork which was overlaid on the aluminum. We’ll also have a toe rail and full sized cleat. The topmast will stand vertically with the yard alongside and the club will be at lying horizontal at the foot of the yard. we’ll have postings on this shortly. 3. RELIANCE’s topmast did break during one of the trials (CONSTITUTION suffered two broken topmasts). Notes from Iselin’s journal show a diagram of a splinter of wood breaking off from the slot in the topmast in which the fid lodged. The resulting slackness in rigging caused the dismasting even in the very light wind conditions. A new mast was sent from Bristol the next day by steamer and RELIANCE was racing again in very short order. I believe the Curator’s log discusses this June 1903 event. This replacement mast was Sitka not Douglas fir as in the original and according to Iselin was 23% lighter. 4. Our team has prepared a paper for the May 2014 Classic Yacht Symposium discussing our observations of Herreshoff Manufacturing Co as an advanced high-tech manufacturing firm with relevance to today’s business. We also discuss our observations of N.G. Herreshoff as a manufacturing engineer and structural, materials and weight engineer. The topmast figures in these discussions.